The effects of puberty on girls in grades 6-8 in Kenya often get in the way of their studies. Aiming to change this situation, “Support-a-girl” provided reusable sanitary pads for 81 girls in Sheywe Primary School, Kakamega County. The Support A Girl project in action on the Sheywe Primary School in Kenya, explaining how to use the pads. 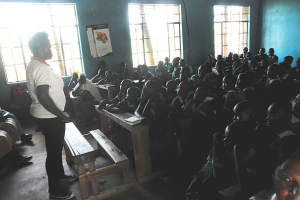 At the same event, nurses provided sexual and reproductive health educational lessons for girls and boys, and also participated on a career advice session. Currently the project is looking for partnerships and sponsors to continue its work and expand to other schools. A key concern is that some of the girls do not have undergarments, required for the pads to properly work – a solution would be to supply the clothing pieces together with the pads. For more information on how to support, visit http://anjasolalasw.wix.com/almasi#!projects/cfvg.